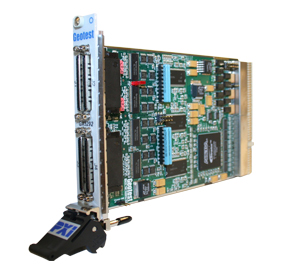 The GX5290 Series are a high performance, cost-effective 3U PXI dynamic digital I/O boards offering 32 TTL or LVDS input or output channels with dynamic direction control. The GX5290 Series also supports deep pattern memory by offering 256 MB of on-board vector memory with dynamic per pin direction control and with test rates up to 200 MHz. The single board design supports both master and slave functionality without the use of add-on modules.